Which Razor Dirt Bike is BEST for you? When it comes to high performance electric toys, no one does it better than Razor! Be sure to check out our 8 Reasons Why to Buy a Razor Dirt Bike! Today we are going to take a closer look at the different models of Razor electric dirt bikes. 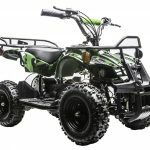 There are several different models available and the Wild Child Crew wants to make sure that you are purchasing the best Razor dirt bike to fit your specific needs. Check the current prices on the entire lineup of Razor Dirt Bikes. 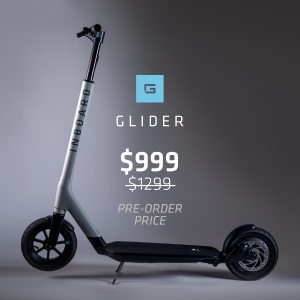 Your first option will be the smaller, lighter bikes with a lower top speed. The Razor dirt bikes included in this category include the MX350, SX350 and MX400. 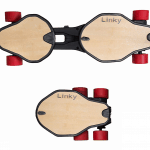 These mini bikes cater more to younger, smaller riders that might be new to riding. Your second option will be the larger, heavier bikes with a higher top speed. The Razor dirt bikes included in this category include the MX500, SX500 and MX650. 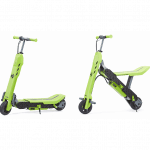 These mini bikes are designed for older more experienced riders. 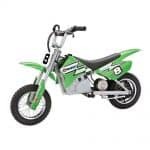 You can see on our Razor dirt bike comparison chart above that the youngest recommended rider age for any one of the Razor dirt bikes is 13 years old. 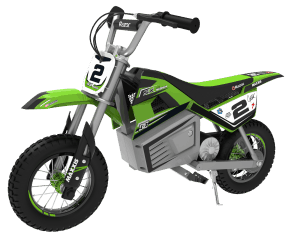 The first questions that we get is, “What Razor dirt bike is best for someone under 13?” As a parent, this is where we recommend that you take a closer look at your child and the experience, or lack thereof that they already have riding mini dirt bikes. 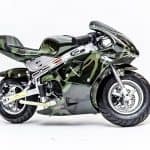 Some kids will need to spend more time learning on the smallest Razor dirt bikes, the MX350 or MX400 while other riders will more quickly and easily advance to the larger and faster bikes like the MX500 and MX650. Why buy a Razor Dirt Bike? Razor has been in the electric dirt bike game for a long time. 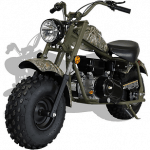 When you purchase a Razor dirt bike, you are getting a good quality dirt bike at a very reasonable price. Yes, there are better and faster electric dirt bikes out there but be ready to drop several thousand dollars for these models. The entire lineup of Razor dirt bikes will give a cost affordable way to get out riding and you can upgrade to one of these more expensive options down the road. 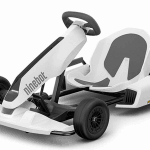 Easy to operate with minimal maintenance especially when compared to gas powered mini dirt bikes. Electric motors provide nice torque and power. The bigger, more powerful Razor dirt bikes like the MX650 are pretty fast off the line! Great starter bikes. 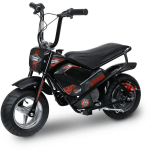 The smaller Razor dirt bikes like the MX350 or MX400 are fantastic entry level mini bikes to get the rider familiar with things like a twist grip throttle and hand operated braking. Quiet and better for the environment. 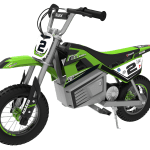 Let’s go ahead and take a look at our Razor electric dirt bike review and show you the specific details of each electric Razor dirt bike. Let’s start this Razor dirt bike review with the largest and most powerful of the Razor dirt bikes, the MX650. This Razor dirt bike weighs approximately 98 lbs. The main difference between the MX650 and all other Razor dirt bikes is the heavy duty construction of the bike allowing for a heavier rider with a slightly faster max speed. This electric Razor dirt bike comes in both yellow, black and orange. Check out our other article for a more in depth review including all of the specs and features of the Razor dirt bike MX650! Who is the Razor MX650 designed for? The MX650 is the best Razor dirt bike for riders ages 16 and older with a maximum rider weight of 220 pounds. 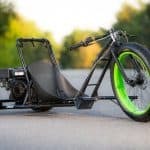 Since this Razor dirt bike weighs almost 100 pounds, you will need to make sure that the rider is strong enough to hold the bike up and move it around. How tall is the Razor Dirt Bike MX650? The Razor MX650 is 36 inches high from the ground to the handlebars, 56 inches long and 24.5 inches wide. The seat height on the MX650 is about 24.5 inches. This gives a better idea of how tall the rider needs to be for their feet to be able to touch the ground. What is the Top Speed and Range of the MX650? The Razor Dirt Bike MX650 has a top speed of 17 mph with up to 40 minutes of continuous use or range of 10 miles with a full charge. What do we like most about the Razor MX650 Dirt Rocket Electric Motocross Bike? COST – At this price point, the Razor MX650 electric dirt bike is about as good as it gets. You are getting a great electric powered dirt bike with a nice top speed and good range. The only other dirt bike that rivals the MX650 at this price would be the Monster Moto 1000 watt. If you’d like to learn more about this dirt bike, check out our article on Best Electric Dirt Bikes Under $500. COLOR OPTIONS – The Razor MX650 was originally released in yellow. Since then, Razor has added both black and orange. The orange MX650 dirt bike is by far our favorite! What would we change about the Razor MX650 Dirt Rocket Electric Motocross Bike? CHARGE TIME – The charge time for the MX650 is up to 12 hours. Be sure to plan accordingly or otherwise you’ll be out of luck with a dead battery and a long wait. How much does the Razor MX650 cost? This Razor electric dirt bike is going to run you under $550. However, from time to time you will find the MX650 for less than $500. Check out the current deals on the Razor MX650 Dirt Bike! Where do you buy the Razor MX650 dirt bike? Now let’s take a quick look at the younger brother of the MX650, the MX500. This Razor dirt bike weighs approximately 98 lbs. Here you can see that the MX500 has a slightly lower maximum rider weight and max speed when compared to the MX650. 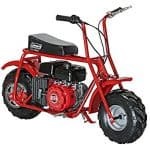 This electric Razor dirt bike comes in red. For more info on all of the specs and features of the Razor MX500, check out this article! Who is the Razor MX500 designed for? The MX500 is the best Razor dirt bike for riders ages 14 and older with a maximum rider weight of 175 pounds. 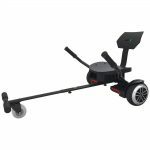 Just like the MX650, the MX500 also weighs almost 100 pounds so be sure that the rider is capable of moving a mini bike of this size around. How tall is the Razor Dirt Bike MX500? The Razor MX500 is 36 inches high from the ground to the handlebars, 56 inches long and 24.5 inches wide. The seat height on the MX500 is about 24.5 inches. What is the Top Speed and Range of the MX500? The Razor Dirt Bike MX500 has a top speed of 15 mph with up to 40 minutes of continuous use or range of 10 miles with a full charge. What do we like most about the Razor MX500 Dirt Rocket Electric Motocross Bike? TOP SPEED & RANGE – The MX500 really delivers with a nice top speed and good range to ensure that your up and coming rider has hours of outdoor fun! What would we change about the Razor MX500 Dirt Rocket Electric Motocross Bike? COST – Depending on the time of year and where you are shopping, you’ll find that the MX500 is priced about the same (or slightly less) than the MX650. Unless your rider simply isn’t big enough or doesn’t have any experience riding electric dirt bikes, you may want to opt for the Razor MX650 dirt bike. How much does the Razor MX500 cost? You should be able to find the MX500 for somewhere between 400 and 475 bucks. Where do you buy the Razor MX500 dirt bike? The next Razor dirt bike that we are going to take a look at is the MX400. This Razor dirt bike weighs approximately 65 lbs. You can find the MX400 in green, red and white. You might be asking yourself, “What’s the difference between the Razor MX400 VS MX350?” Well, these two Razor electric dirt bikes are basically the same model but available in different color combos. Who is the Razor MX400 designed for? The MX400 is the best Razor dirt bike for riders ages 13 and older with a maximum rider weight of 140 pounds. Weighing in at around 65 pounds, the MX400 is going to be one of the lightest Razor dirt bikes. This makes the MX400 a great option for a smaller, younger rider. How tall is the Razor Dirt Bike MX400? The Razor MX400 is 31 inches high from the ground to the handlebars, 44 inches long and 24.5 inches wide. The seat height on the MX400 is about 22.5 inches. What is the Top Speed and Range of the MX400? The Razor Dirt Bike MX400 has a top speed of 14 mph with up to 30 minutes of continuous with a full charge. What do we like most about the Razor MX400 Dirt Rocket Electric Motocross Bike? SIZE – If you’re looking for a great starter bike, you can’t go wrong with this Razor electric dirt bike. What would we change about the Razor MX400 Dirt Rocket Electric Motocross Bike? BATTERY – We would like to have a little bit of a better range on a full charge with the MX400. The current ride time on the MX400 dirt bike is 30 minutes and it would be nice to see a longer ride time similar to the MX500 and MX650. How much does the MX400 cost? The Razor MX400 is going to run you somewhere between $300 and $400. Where do you buy the Razor MX400 dirt bike? Now on to the scaled down MX350. Based on our Razor dirt bike review, this MX350 is the best starter bike from the entire Razor lineup. This Razor dirt bike weights approximately 65 lbs. 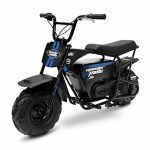 This electric Razor dirt bike comes in blue, black, pink and red. Still not sure if the Razor dirt bike MX350 is right for you? Be sure to check out our detailed review. Who is the Razor MX350 designed for? The MX350 is the best Razor dirt bike for riders ages 13 and older with a maximum rider weight of 140 pounds. Just like the MX400, the MX350 also weighs in at 65 pounds making it the lightest Razor dirt bike and the best option for younger riders. How tall is the Razor Dirt Bike MX350? The Razor MX350 is 31 inches high from the ground to the handlebars, 44 inches long and 24.5 inches wide. The seat height on the MX350 is about 22.5 inches. What is the Top Speed and Range of the MX350? The Razor Dirt Bike MX350 has a top speed of 14 mph with up to 30 minutes of continuous with a full charge. What do we like most about the Razor MX350 Dirt Rocket Electric Motocross Bike? 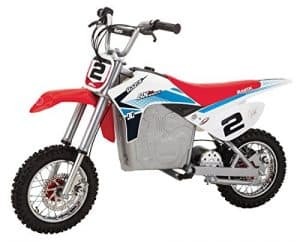 SIZE – The MX350 is a great entry level electric dirt bike to get your child familiar with throttling, braking and balancing. It’s not too heavy, making it fairly easy to maneuver. You can also check out our article on Best Kids Electric Dirt Bikes Under $300. What would we change about the Razor MX350 Dirt Rocket Electric Motocross Bike? NO SUSPENSION – The newer models of the MX350 do not have any front or rear suspension. CHARGE TIME – As is the case with all of the Razor electric dirt bikes, the charge time for the MX350 is up to 12 hours. Not a deal breaker by any means, but just something to be aware of. How much does the MX350 cost? The Razor MX350 is going to be the cheapest Razor dirt bike listed in this review. You should be able to find this electric dirt bike for somewhere between $250 and $300. Where do you buy the Razor MX350 dirt bike? The SX500 is one of our favorite Razor electric dirt bikes. The SX500 is very similar to the MX500. The main difference with the SX500 is the authentic Jeremy McGrath graphics and fairing design. 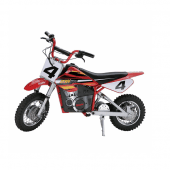 This Razor dirt bike weighs approximately 98 pounds and is available in both red and green. If you are looking for a little “Showtime” then look no further than the SX500! Here’s another article on all of the specs & features of the SX500 Razor dirt bike! Who is the Razor SX500 designed for? The SX500 is the best Razor dirt bike for riders ages 14 and older with a maximum rider weight of 175 pounds. This is another one of the heavier Razor dirt bikes, weighing almost 100 pounds. Be sure that the rider can handle that weight. How tall is the Razor Dirt Bike SX500? The Razor SX500 is 36 inches high from the ground to the handlebars, 56 inches long and 24.5 inches wide. The seat height on the SX500 is about 24.5 inches. What is the Top Speed and Range of the SX500? The Razor Dirt Bike SX500 has a top speed of 15 mph with up to 40 minutes of continuous with a full charge. What do we like most about the Razor SX500 Dirt Rocket McGrath Mini Bike? DECALS & GRAPHICS – Well, this is a no brainer! The Jeremy McGrath graphics and decals really make this Razor dirt bike pop! What would we change about the Razor SX500 Dirt Rocket McGrath Mini Bike? CHARGE TIME – Yep, you guessed it. The main area where we’d like to see Razor make an improvement to their entire lineup of dirt bikes would be a faster charge time. How much does the Razor SX500 cost? Right now, you’ll find this dirt bike in either green or red from $450 to $475. The slightly higher price that you’re paying when comparing this bike to the MX500 is for the graphics and color combo. 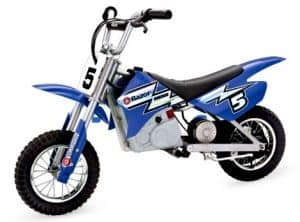 Where do you buy the Razor SX500 Dirt Rocket McGrath Mini Bike? Yes, there is officially an SX350 that has been released. Here’s what we know so far about this new Razor dirt bike. The SX350 is very similar to the MX350. The main difference with the SX350 and just like the SX500, is the authentic Jeremy McGrath graphics and fairing design. This Razor dirt bike is available in green. Learn more about the SX350 in our detailed review. Who is the Razor SX350 designed for? 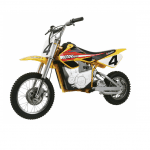 The SX350 is the best Razor dirt bike for riders ages 13 and older with a maximum rider weight of 140 pounds. What is the Top Speed and Range of the SX350? The Razor Dirt Bike SX500 has a top speed of 14 mph with up to 30 minutes of continuous with a full charge. How tall is the Razor Dirt Bike SX350? The Razor SX350 is 31 inches high from the ground to the handlebars, 44 inches long and 24.5 inches wide. The seat height on the SX350 is about 22.5 inches. The Razor Dirt Bike SX350 has a top speed of 14 mph with up to 30 minutes of continuous with a full charge. What do we like most about the Razor SX350 Dirt Rocket McGrath Mini Bike? DECALS & GRAPHICS – We really like the Jeremy McGrath inspired graphics and decals. BLACK RIMS – The black rims on this Razor dirt bike really give the SX350 a clean, sleek overall look. 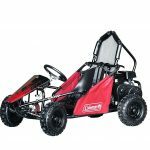 What would we change about the Razor SX350 Dirt Rocket McGrath Mini Bike? CHARGE TIME – Even with the new UL approved chargers, you’re still looking at a 12 hour charge time. NO SUSPENSION – Similar to the MX350, the SX350 does not have any suspension. How much does the Razor SX350 cost? It looks like the SX350 is selling for under $350. Grab this new awesome Razor dirt bike TODAY! 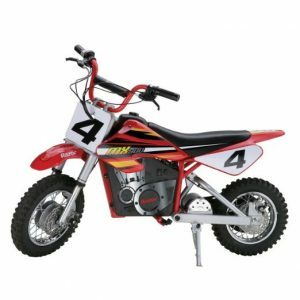 Where do you buy the Razor SX350 Dirt Rocket McGrath Mini Bike? Razor MX500 VS MX650 – What’s the difference? We get this question a lot and wanted to quickly show you the main differences between the Razor MX500 VS MX650. In short, the most noticeable difference between the MX500 and the MX650 is that the MX500 is powered with a 500 watt motor and the MX650 uses a 650 watt motor. You’re basically getting more power and a higher top speed with the MX650. So there you have it! Now you know the main differences between the Razor MX500 VS MX650! We get asked a lot about comparing the similarities and differences of all of the different Razor dirt bikes. In order to make your search easier, here all of the different comparison reviews that Wild Child Sports has done comparing all of the best Razor dirt bikes! What’s the difference between the Razor MX350 VS MX400? If you’re interested in how the Razor dirt bikes compare to the Razor street bikes, check out the MX650 VS RSF650 and RSF350 VS RSF650. 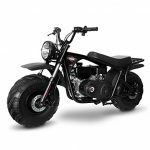 There are a number of different modifications that you can make to any one of these Razor electric dirt bikes models. One of the coolest videos that we came across featured the MX500. This video clocked a modified MX500 dirt bike going over 40 mph. Check it out! Here’s another really cool Razor electric dirt bikes video showcasing the off road capabilities of the SX500. ﻿ Thanks for stopping by and checking out Razor Dirt Bike Review! Be sure to check out some of these other great kids dirt bikes brought to you by Wild Child Sports!